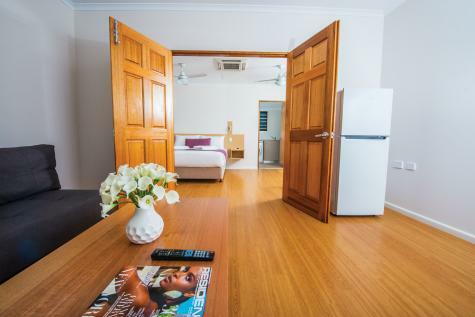 Set in the Northern suburbs of Darwin just 200 m from the stunning Lee Point Beach, Club Tropical Resort Darwin features 2 salt water pools, BBQ areas, Al-fresco dining area and an on-site restaurant. Darwin International Airport is a 5-minute drive away and TIO Stadium in Marrara is a 10-minute drive. Darwin CBD and Charles Darwin National Park are both within a 20-minute drive away by car. Guests arriving outside reception hours must contact the resort in advance to arrange after hours check in. Resort offers 12 disabled accommodation rooms and wheelchair access to reception and restaurant. From Darwin Airport: On exiting Henry Wrigley Drive, turn right at the lights, move across to the left lane to take the first left - this is Lee Point Rd, follow it to the end for Club Tropical Resort. Driving into Darwin from the South: From the Stuart Highway just through Pinelands, (follow the signs for Casuarina) turn right onto McMillans Rd, turn right at the first round about on the corner of McMillans and Vanderlin, at the next round-about on the intersection of Vanderlin and Lee Point Rd, turn right into Lee Point Rd and follow it to the end for Club Tropical Resort. Driving from Darwin CBD: Take the Stuart Highway exit out of the city, at the underpass, turn left into Bagot Rd, follow that straight down until you come to Vanderlin Drive (Casuarina Shopping Centre will be on your left), turn right into Vanderlin, at the round-about, turn left into Lee Point Rd and follow it to the end for Club Tropical Resort. Spacious parking facilities available on-site, no charge applicable. Complimentary airport transfers - on request.